Katy and John Anderson, owners of Anderson Equestrian Center. Anderson Equestrian Center, LLC is a full-service boarding and lesson facility owned and run by Katy and John Anderson. Located on the western side of Callaway County (near the Boone County border), it is the fulfillment of a life-long dream for Katy, who grew up with a love of horses and a love of teaching and hoped to one day combine the two. Katy grew up riding and showing Saddlebred horses in saddle seat equitation and pleasure divisions. Together Katy and her partner, Katina’s Black Beauty, acquired quite an array of ribbons and trophies in their youth, earning high point awards from the Pennsylvania Saddlebred Horse Association and Eastern Saddle Horse Breeder’s Association, as well as top ribbons at shows such as the Devon Horse Show, Pennsylvania National and Syracuse International. Katy’s professional experience in the horse world started early. 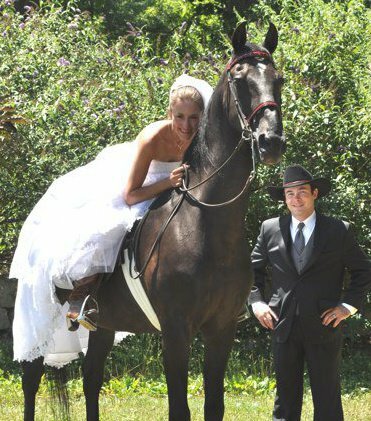 She worked as a groom for her childhood horse trainer during high school to help off-set her show bills, and spent multiple summers teaching riding lessons at a local children’s YMCA summer camp where she earned certification with the Certified Horsemanship Association or CHA. While attending college at William Woods University in Fulton, Missouri she interned at Smoke Hollow Farm in New Jersey, Mark Hulse Stables in Missouri and Cross Creek Stables in Oklahoma where she gained valuable experience and solidified her desire to make horses a part of her career, and graduated in 2009 with a bachelor’s in equestrian science and special education. It was during her final year at William Woods that she met John, who also had a background in horses and training as a farrier. They were married just a year later, and Katy’s old partner Beauty even got to partake in the wedding celebrations. Throughout the next few years Katy and John worked tirelessly to make Katy’s dream of owning and operating her own boarding and lesson facility a reality, and they finally opened Anderson Equestrian Center in the summer of 2014. 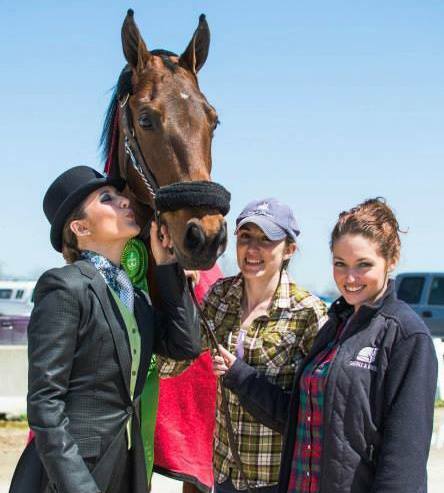 Since the successful opening of AEC, Katy has also earned an MED in education, and is one of only three saddle seat instructors in the state of Missouri to be certified by the American Riding Instructors Association. AEC now boasts a full barn of boarders and a thriving lesson program, where Katy starts students from the ground up, providing them with the fundamentals needed to produce strong, talented riders, and instilling in them a lifelong love of horses. Whether working with children or adults, Katy has a knack for communicating even the most difficult concepts clearly, and this, along with her unlimited patience, makes her the ideal teacher for riders of all levels. Learn more about AEC here.